For some reason I'm getting so many messages concerning my easy media creator 9. Runtime to terminate in an unusual way please contact application support for more information. So what changed on your computer? Did you try working with an older video that worked before? What format is the video you are trying to use and how did you get it? Basically what the error is is that the video and audio are different files and they have to be brought together -multiplexed (muxed) to play correctly. That is not happening. Read this (link) go down to the video information. There could be dozens of reasons. My guess is that the video file is "bad". That is why I asked you to try an older file that worked before. Please provide this information along with what changed/was updated on your computer. Link to questions. I had to reinstall AVG security. That's when the trouble started. I uninstalled easy media 9 from add and remove programs, reistalled it. when I add the videos .mov and tried mp4 and hit burn nothing happens with encoding. It is possible that AVG wiped out some need registry entries. Remove EMC 9 using the free Revo Uninstaller using the MODERATE mode (only) and then shiut off AVG ; reinstall. Do not let the registry cleaner in AVG free do any registry cleaning or you may end up with the same problem. Hvae you been able to work with the mov and mp4 files before? Do you have one to try that worked before. Did you remember to update to EMC 9.1 when you reinstalled? Yes, I have used these files before without a problem,I'm getting so many messages when trying to save a file to dvd. Did you remember to update to EMC 9.1 when you reinstalled? No I did not. When using Revo uninstaller will it ask me "do I want to delete something because other programs may use this"
I'm not sure when using uninstalling that questions may come up that I don't know how to answer. What other Roxio products do you have on your computer? Usually a person gets that message if there are more than one and if they are similar. You have EMC 9.1 where you posted; did you mean to post somewhere else? I only have roxio emc 9.1 I went to add remove programs and removed then installed it but I tried to update it as someone suggested so I don't know if that's the problem and now I would like to use the Revo uninstaller but am afraid it might cause more problems with other programs. If you are afraid of the REVO, you can compltely uninstall the program following the detailed Roxio process (here). I am really a novice this kind of message makes me afraid I'll mess up my whole computer! Also when I go to show hidden folders nothing appears goes back to control panel page. To show hidden files. This can be done by clicking on my computer then go up and click on Tools -> Folder Options -> View tab. 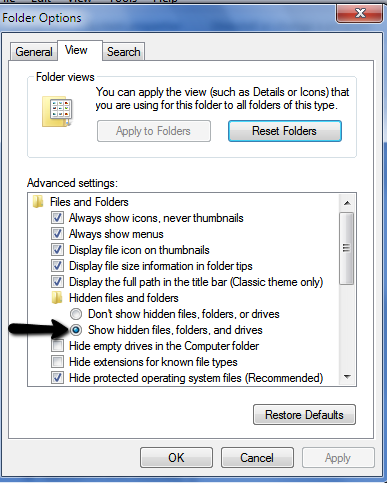 Make sure show hidden folders is selected and click Apply. Yes, I click on apply and it goes right back to previous page my computer.